Australians dispose of 4 billion plastic bags a year. The average bag is used for 12 minutes but takes 1000 years to break up. Plastic bags in the environment are detrimental to birds, marine animals and ecosystems, as well as human health and the economy. Plastic Free Douglas – a group consisting of Douglas Shire Council, the Douglas Shire Sustainability Group, Low Isles Preservation Society, Tangaroa Blue, the Cairns and Far North Environment Centre and Bendigo Bank – wants to reduce the number of disposable plastic bags which end up as litter and landfill. Plastic Free Douglas is asking Retailers to lead by example by promoting alternatives to plastic shopping bags. If your business can commit to being disposable plastic bag free we want you to become an ambassador by registering with Plastic Free Douglas, and display your eco-credentials with our Proudly Plastic Bag Free shop sticker and share your tips in our online promotions. Plastic Free Douglas is asking individuals to join the growing number of Australians who avoid disposable plastic bags by bringing their own reusable bag or basket or using cardboard boxes for their purchases. Learn how to make your stall or event plastic-free! 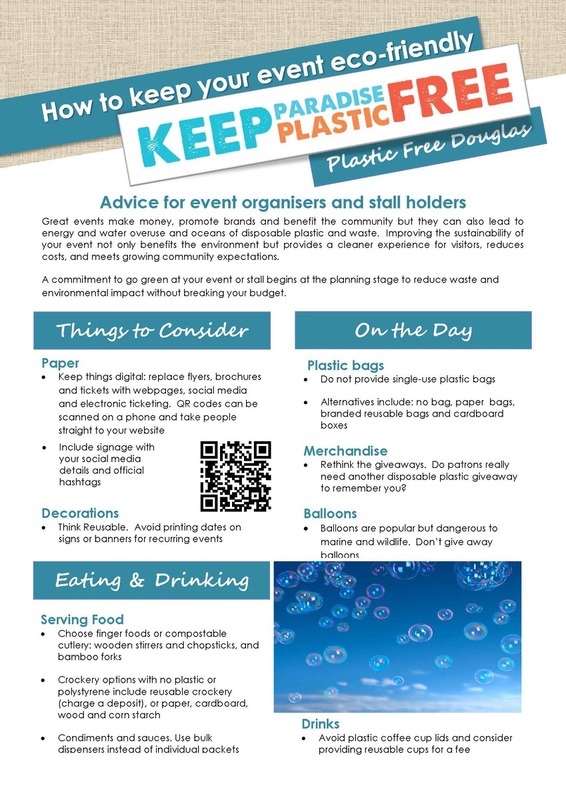 A new brochure produced by Council with Plastic Free Douglas has eco-friendly advice for event organisers and stall holders who want to reduce the impact of plastic on our world heritage environment. How to keep your event eco-friendly provides information about a range of alternatives to single-use plastic. Download your brochure or visit Council offices. 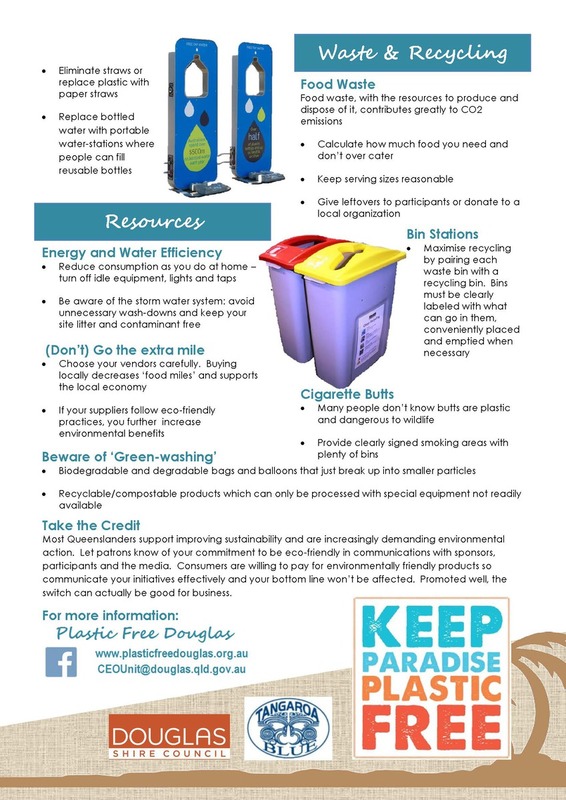 To register your interest in the Plastic Free Douglas campaign, email ceounit@douglas.qld.gov.au or visit the Plastic Free Douglas Facebook page. As a convenient material, plastics have taken over our lives and are consumed and discarded in great numbers. They never biodegrade, but over time break up into smaller and smaller fragments, and every piece of plastic that ever entered the environment still exists. About 8 million tonnes of plastics enter the ocean every year where millions of animals die from the entanglement and ingestion of rubbish. The tiny toxic plastic remnants from degraded items can impact entire ecosystems like coral reefs and the food chain of our seafood supply. Additives in plastics (e.g. in plastic bottles or food packaging) leach into our food and cause various health problems. Every year, cleaning up littered single-use items costs communities millions of dollars. Over 21 million tons of waste go to our already limited landfill spaces in Australia every year. What does it mean to go plastic free? Living entirely plastic free is possible and an interesting challenge, but not feasible for most people. However, the biggest environmental concern is posed by single use items such as plastic packaging, bottles, bags or straws. Eradicating these products from your life or replacing them with durable and eco-friendly alternatives is a matter of habit rather than a compromise in quality and convenience. Waste that doesn’t exist will not be a problem. Plastic you don’t own won’t make you sick. Things you will throw away (packaging, single use products) won’t cost you money if you don’t buy them in the first place. It’s time to leave the throw-away-society. Let’s start with plastic bags! Saying “no” to plastic bags is easy. European countries have lived without free plastic shopping bags for decades. South Australia followed suit in 2009 and the Northern Territory in 2011. Lead by example in the Douglas Shire by reducing or removing plastic bags from your shop. Make your business stand out and use your decision as an excellent marketing opportunity – “proudly plastic bag free”. Reduce your operating costs by reducing the use of disposable bags. You will be surprised how many customers approve of your decision. Install signage and information leaflets for your customers. Ask customers to bring reusable bags. Only offer a bag if the customer asks for one. Switch to paper or corn starch bags or introduce a fee. Team up with other retailers and buy reusable bags in bulk. Train your staff to become bag-wise. Don’t be misled by so-called single use alternatives. Degradable bags fall apart faster than conventional plastic bags but remain toxic plastic dust. Biodegradable and compostable bags only break down in ideal conditions, can still do harm until then and can also have toxins added since the terms are not clearly defined. parachute bags, baskets, folding crates etc. Always keep some bags in your car and remember to bring them with you. Ask for cardboard boxes if you bought more than expected. Avoid plastic bags for your fruit and veggies or use paper mushroom bags or reusable produce mesh bags instead. If you compost at home, all the “yukky stuff” is taken care of and you don’t even need plastic bags as a bin liner anymore.